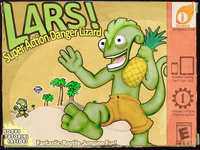 Meet Lizard Lars: Super Action Man of International Danger Lizard. Follow Agent Lars from the perilous beaches of “Tutorial Bay” through the dense and dangerous “Jungles of Extreme Peril” on your quest to save the world from the clutches of sinister forces. Only Lars can confront the mad organization of doom lurking in the ancient island ruins, learn their terrible and destructive secrets, and ultimately foil whatever evil plan they have scheduled for this week. Will good prevail? It will take all of your skill and cunning as you jump, dodge, and swim your way through over 60 intense levels of platform-shaped danger.